Vada's Blog Stamp Inks and Paper : GC- #118 “Spicy Supply Challenge”. “Crimpers”, is the Theme for the Spicy Supply Challenge. Wow when was the last time you have used your crimper? Remember back when these wonderful tools came out? I too couldn’t wait to own one, and when I did, I used it all the time as it was our only way to (attempt) to have an (Embossed) background. I remember spraying regular cardstock with adhesive and adding brown fabric to it and running that through the crimper to have a “Faux Corduroy Fabric” look. Ok Never Mind, I’m dating my self. 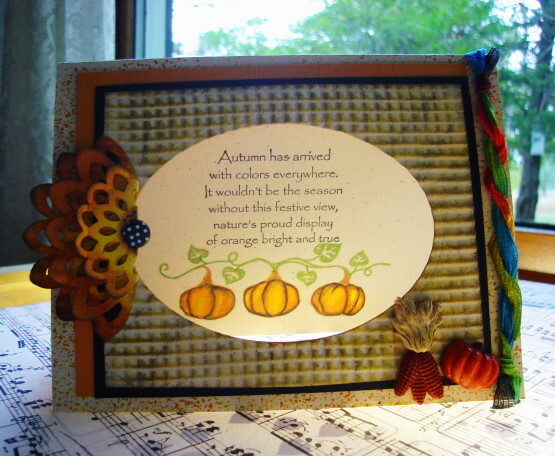 For My Card; Stamps used, DRS “Autumn Has Arrived“, Inkadinkado “Pumpkin and Vine”. 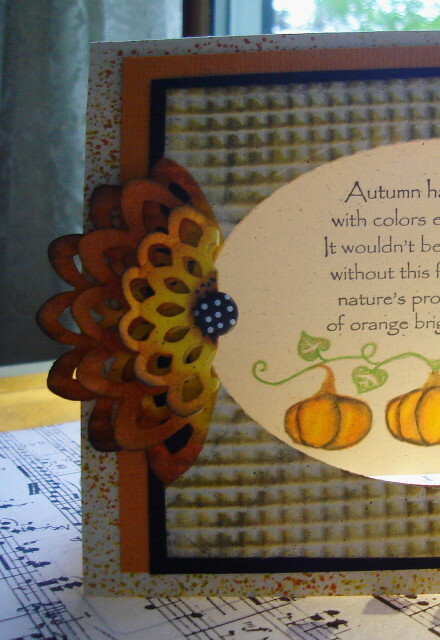 Spellbinders Oval Dies, and EK Success Large Flower Burst punch. This challenge runs until Oct. 09 2011 so there’s time to look up your crimper and join this challenge. Thanks for stopping in today. Have a great Sunday afternoon. 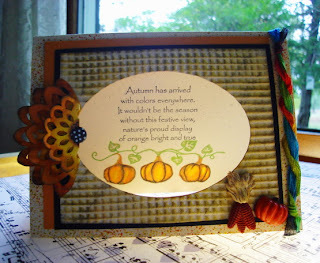 Beautiful card, Vada! That texture reminds me of a waffle cone for ice cream.... yum, LOL! Good techniques never go out of style, your card looks great. I agree with Jean, it looks kind of like a waffle cone, who can say no to one of those? oh yeah, I remember uasing my crimper, Whats that saying "We've come a long way baby" LOL yes the embossing plates sure made it easier. Your waffle pattern looks cool. Grat job! Charming piece, Vada! Thank you for digging out that crimper and joining in at Gingersnap Creations for the Spicy Supply Challenge! Quite delightful Ms. V! I should dust off my crimper & crimp something! I remember 'needing' the crimper too and what a great challenge - bring out an old tool. And your waffle pattern is so awesome! Love the texture the crimper brings to your piece! Fabulous. Thanks for joining us at Gingersnap Creations.